Roasted parsnips are an important part of a British Sunday Roast, Christmas lunch or, quite frankly, anytime. The aroma of them cooking is just irresistible. The simplest way to roast parsnips is to par boil as the recipe below and to them cook in a good flavored fat like goose or duck (vegetable oil if you want it lighter). 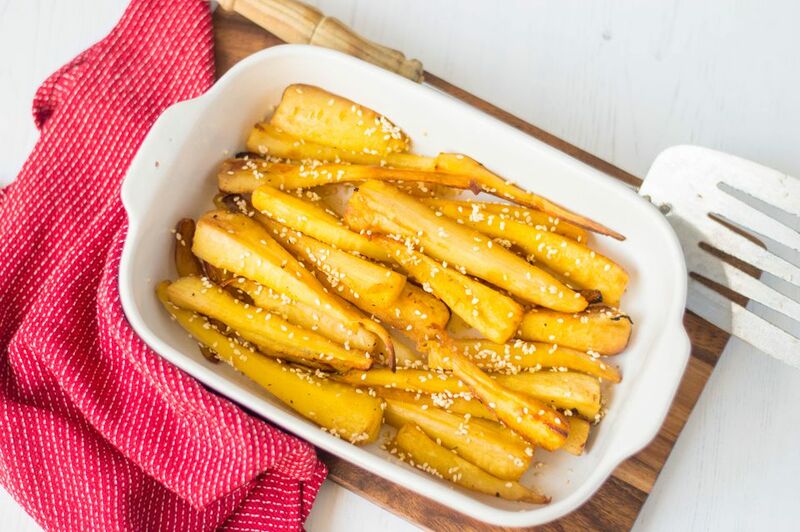 For an extra special treat, try this glazed parsnip recipe by adding a dash of maple syrup and a sprinkle of sesame seeds for extra flavor and a little crunch. This takes the parsnip to whole new heights. This sophisticated addition to the recipe ensures they can still be part of a traditiona dinner or special occasion party. The humble parsnip has never looked so good. Don't be surprised if they soon become a favorite on your dinner table. Preheat oven to 425 F/220 C/Gas Mark 8. Heat a heavy bottom frying pan or skillet to hot, but not burning. Add the sesame seeds to the dry, hot pan and gently swirl the pan around until you notice the seeds starting to color. Whip them out of the pan and onto a plate immediately you see any color. They will continue to cook even when on the plate. Cut the peeled parsnips in half lengthways and in half again. If the parsnips you are using are a little old or are woody, you will need to cut into quarters and remove the wooden cores. Once done, they will taste just as good as young parsnips. Bring a pan of water to a boil. Add a pinch of salt and the parsnips and cook for 2 minutes. Drain in a colander keep to one side. In a small saucepan, melt the butter with the maple syrup and heat gently. Place the cooked parsnips in a roasting tin and brush thoroughly with the maple-butter mixture. Season well with salt and pepper. Roast in the oven, shaking the pan frequently, for 30 minutes or until golden brown. Sprinkle over the sesame seeds and return to the oven for 5 minutes. Transfer to a warm serving dish, serve immediately or keep warm until needed. If you don't have maple syrup, you can also become a little inventive; a little honey is also delicious and a tiny drizzle of golden syrup (corn syrup in the US) can also work wonders. The sesame seeds do work very well for that extra crunch and flavor. If you don't have them, then leave them out.